The region is said to compare with the well-documented "great Pacific garbage patch". 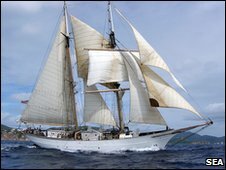 Kara Lavender Law of the Sea Education Association told the BBC that the issue of plastics had been "largely ignored" in the Atlantic. She announced the findings of a two-decade-long study at the Ocean Sciences Meeting in Portland, Oregon, US. The work is the conclusion of the longest and most extensive record of plastic marine debris in any ocean basin. Scientists and students from the SEA collected plastic and marine debris in fine mesh nets that were towed behind a research vessel. The nets dragged along were half-in and half-out of the water, picking up debris and small marine organisms from the sea surface. The researchers carried out 6,100 tows in areas of the Caribbean and the North Atlantic - off the coast of the US. More than half of these expeditions revealed floating pieces of plastic on the water surface. These were pieces of low-density plastic that are used to make many consumer products, including plastic bags. Dr Lavender Law said that the pieces of plastic she and her team picked up in the nets were generally very small - up to 1cm across. "We found a region fairly far north in the Atlantic Ocean where this debris appears to be concentrated and remains over long periods of time," she explained. "More than 80% of the plastic pieces we collected in the tows were found between 22 and 38 degrees north. So we have a latitude for [where this] rubbish seems to accumulate," she said. The maximum "plastic density" was 200,000 pieces of debris per square kilometre. 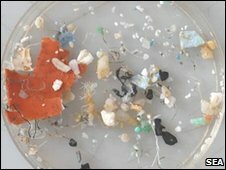 "That's a maximum that is comparable with the Great Pacific Garbage Patch," said Dr Lavender Law. But she pointed out that there was not yet a clear estimate of the size of the patches in either the Pacific or the Atlantic. "You can think of it in a similar way [to the Pacific Garbage Patch], but I think the word 'patch' can be misleading. This is widely dispersed and it's small pieces of plastic," she said. The impacts on the marine environment of the plastics were still unknown, added the researcher. "But we know that many marine organisms are consuming these plastics and we know this has a bad effect on seabirds in particular," she told BBC News. Nikolai Maximenko from University of Hawaii, who was not involved in the study, said that it was very important to continue the research to find out the impacts of plastic on the marine ecosystem. He told BBC News: "We don't know how much is consumed by living organisms; we don't have enough data. "I think this is a big target for the next decade - a global network to observe plastics in the ocean."